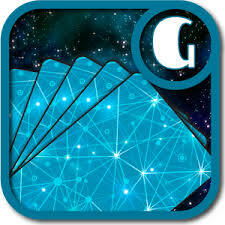 Last week I reviewed the Uni Tarot app, this week I am reviewing the Galaxy Tarot Pro app made by Galaxy Tone. Galaxy Tone offers Galaxy Tarot free on android phones through the Google Play Store, however, the Galaxy Tarot Pro costs about $4.95. Galaxy Tarot Pro is a wonderful app and is one of my favorites. No wonder why the app was voted Tarot Professionals “Best Tarot App” Tarosphist Award 2013. The app also has an award-winning Tarot Card Reader & Tarot Encyclopedia which are really great features that are literally right at your fingertips! The Galaxy Tarot Pro apps offers many features but may favorite is the ability to choose from twenty tarot spreads which have accurately provided insight to my own personal life concerns and have also provided me with additional resources for training with the tarot cards. Galaxy Tarot Pro also features a reversed tarot card option which include keywords and interpretations for each tarot card. A really nice feature of the Galaxy Tarot pro app is that it give interpretations from Galaxy Tone, A.E. Waite’s “Pictorial Key to the Tarot”, and easy access to Wikipedia entries on each Tarot card. Amazing! Galaxy Tarot Pro offers the following spreads: basic spreads such as the One card, Past, Present, Future , Celtic Cross, Relationship and Two Card spreads just to name a few. To learn more about the Galaxy Tarot Pro app visit https://play.google.com/store/apps/details?id=com.galaxytone.tarot. Unit Tarot is a wonderful app that gives you access to 8 tarot decks. The tarot decks are as follows: Rider Waite-Smith, Soprafino Tarot, Tarot of Giovanni Vacchetta, 1JJ Swiss Tarot, Grand Etteilla Tarot, Etteilla III, Sola Busca Tarot and the Tarot of Marseilles. All of the tarot decks are free with the exception of the Tarot of Marseilles deck which cost $4.95. In addition to the tarot card decks, the Uni Tarot app features 15 spreads which are Single, Three card, Relationship, Five card, Celtic Cross, Horseshoe, This Week, The Mirror, The Pentagram, The Hexagram, The Mandala, The Tree of Life, The Key, The Ankh, The Chariot spreads. The Unit Tarot app even allows you to create your own spread. Can You say WOW! The Uni Tarot app can also be used as a learning tool for beginners and professionals. I myself enjoy experimenting with the different spreads because they reinforce my recognition of the tarot cards and provide accurate readings regarding life’s various problems. Each cards information is provided in many aspects: Astrology, Numerology, Elements, Colors, Esoteric Title, Intelligence, correspondence in the Hebrew alphabet, position in Kabbalistic tree of life and many more. Really good learning material! The Unit Tarot app also allows you to send spreads to friends via email and export to other devices, share spreads on Facebook and twitter, provide Optional notification “Card of Day”, Search card by name, Customize background (15 colors + 17 textures), Visual shuffling deck and choosing cards, Screen rotation support and tablet support. The Uni Tarot version 2.1 offers many new features but I found the ability to enter a significator position in a spread to be amazing! To learn more about this amazing app visit https://play.google.com/store/apps/details?id=com.ucdevs.utarot. I pulled The Chariot card today as my card of the day! 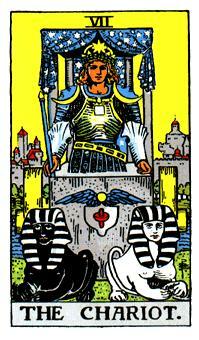 Yipee, in a reading, the Chariot basically indicates a person using their sheer will power to successfully control a situation. I’m leading a busy life at home, at work and at play however, I am holding everything together by the sheer force of my personality. It appears that I will resolve the problems of the day successfully. Happy to see you today Chariot! What are your thoughts regarding the Chariot? Amazing! I pulled the Two of Cups this morning from the Tarot Card deck this morning. In a rush, I wondered how I could apply this card to my day. The Two of Cups signify mutual love and attraction between two people. The love depicted in the relationship is considered a lesser love than depicted in the Lovers tarot card. As a single woman unfortunately with no prospects I found it difficult to apply this card to my day. After running what seemed like a thousand errands, I returned home and shuffled the tarot deck again. Low and behold, I pulled the Two of Cups again as my card of the day! I wondered once again how could I apply this card to my day. I completed a grueling three and a half-year educational program which left me feeling mentally exhausted and burned out. I quietly retreated into peaceful meditation in order to restore my mind. I lost my dog about five months later which led me to open up my heart to a greater extend. As a result, I have a new-found view of the world we live in. I find myself being more loving and appreciative of life! What are your thoughts about the Two of Cups?